This has been my month for hollyhocks. 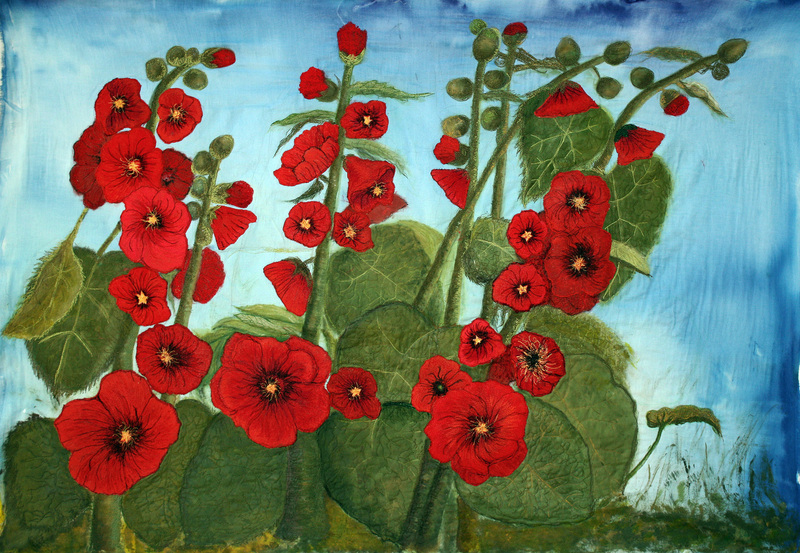 It began with a hollyhock art quilt. One of my customers, who owns a fabric art gallery purchased another art quilt from me. This is the 9th quilt for her. She first found me through the internet.The quilt she chose this time was the hollyhock quilt, pictured above. I was delighted. This quilt was one of my favorites, and it was going to a woman who I Like, a very nice person. However before it sold, it captured the attention of another person. A short jump across the ocean, a psychologist with a practice in Australia noticed the hollyhock quilt while online. She has an affinity for hollyhocks. One is even pictured on her business cards. She also has an interest in art quilts, with a large one already hanging in her office. The internet has shrunk the world, it seems smaller.That thought is no great revelation, we hear it all the time. However my own tiny example impressed that truth upon me personally. We have the ability to connect with people living on the other side of the planet, how unbelievable. .
Three people’s lives overlapped for a moment in time, based on a mutual interest in the same simple art quilt. Living many miles apart, it was unlikely their paths ever would have crossed. To take this a step further. The psychologist, living in Australia, was able to locate and contact the quilt’s maker, living in the states. Two people, living in two different countries brought together despite the huge populations and miles. A business transaction is made. The psychologist is able to obtain an art quilt that suits her needs and the artist gains a new commission. The world of commerce has now become a global market. What strikes me as its greatest potential is we now have the ability to some insight into our differences and similarities. We’re not that different, we love babies and animals, have a need for love and acceptance. And people everywhere like hollyhocks and quilts. My quilt’s new owner will be in the states, near to where I am. She will pick it up in person if it’s done. I will enjoy meeting her, a pleasure I rarely have. I like where my quilt is going, she offers help to those in need of it and she likes hollyhocks and quilts. I think it has found a good home. This is the Red Hollyhock quilt ready for quilting, holly hocks appliqued on, thread paint finished. 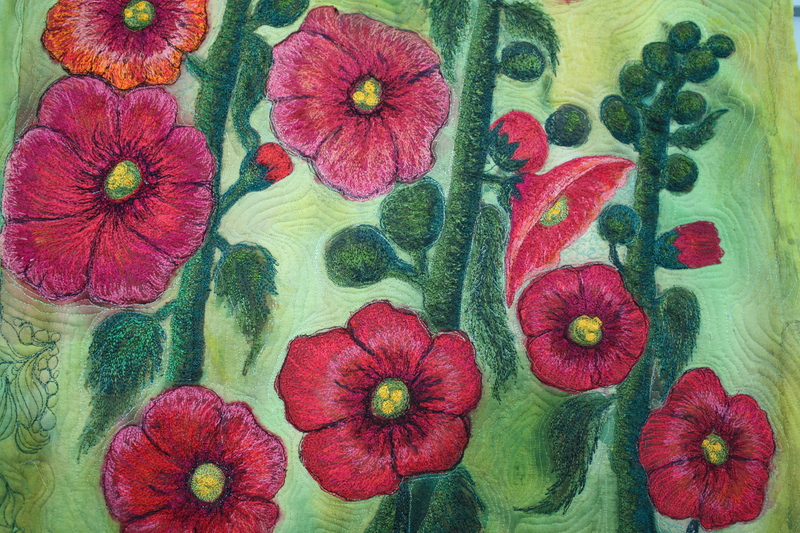 This is the original art quilt that brought 3 hollyhock lovers from all over the world together. [caption id="attachment_10349" align="align center" width="200"] A detailed view of a spray of large hollyhocks from the Red hollyhock art quilt. Ready to quilt. The Red Hollyhock quilt has the quilting yet to be dome. Categories: Blog posts, Internet, Nature Quilts, New quilts, Older Posts-, Stylized Floral Gallery, Stylized Flowers Art Quilts, The internet, The internet, A Shrinking World and connecting Hollyhock Lovers Everywhere!, Uncategorized, Uncategorized., What"s New? Thanks, Carole! I don’t have my issue yet, but will look forward to getting it! I agree that you should start with playing with fabric, then use it for a purse or a garment! That way, you get all three! Barbara: Just thought I’d let you know whenever I click on your links I get an error. I enjoyed watching you move through your art quilts, I make them as well so I follow numerous others to see what is going on out there. But I can never seem to really connect with your website. Love your sewing/painting/finished works though! Thanks Carole for the heads up on the links. I’ll see if I can find the bad ones and repair.